Sir Frederick Pollock, For My Grandson. Remembrances of an Ancient Victorian, London: John Murray, 1933, pp. 127-129. An address written by Sir Frederick Pollock, and delivered by Hubert Parry in Queen’s Hall at the Diamond Jubilee (sixtieth anniversary celebration) of Joachim’s English début. t a time known only by hearsay to most of us, you first brought before an English audience the promise of that performance which has been eminent among two generations of men; which, in gaining an unrivaled wealth of experience, has had no loss to count but that of novelty; which we still welcome as a continuing delight, and which will remain for many generations more as a tradition and example to be prized by those who are born too late for the happiness of immediate knowledge. It was under the auspices of Mendelssohn that you played Beethoven’s Violin Concerto at the Philharmonic Society’s concert on May 27, 1844. No combination could have been more prophetic of your career, though neither its duration in time nor the singular quality of its achievement was then within any probable foresight. At that day the fine arts, and music among them, languished in this country. It was not understood that the function of art is to be not merely the recreation of a privileged class, but an integral element of national life. We have now learnt to know and to do better. Opportunities of becoming acquainted with the music of the great masters have been multiplied tenfold, and the general competence of both execution and criticism has been raised beyond comparison. This great and salutary change which we have witnessed in the course of the last generation is largely due to your exertions. Learning from Mendelsohn and Schumann, and working with Brahms in the comradeship of lifelong friends, you have devoted your whole energies, as executant and as composer, to continuing the tradition and maintaining the ideal of classical music. We now hold it fitting that the sixtieth anniversary of your first appearance here should not pass without a special greeting. The welcome we offer you is alike for the artist who commands every power of the trained hand, and for the musician whose consummate knowledge and profound reverence for his art have uniformly guided his execution in the path of the sincerest interpretation. Your first thoughts as a performer have ever been for the composer and not for yourself. In no hour have you yielded to the temptation of mere personal display, and the weight of your precepts in one of the greatest musical schools of Europe is augmented by the absolute fidelity with which your example illustrates them. The present occasion will, we hope, be memorable of itself. None the less, we desired that you should possess a visible record of it. Mr. Sargent has brought us the willing and generous aid of a sister art, and we have the pleasure of presenting to you the portrait of yourself, which he has employed no common zeal to complete within the time at his disposal. As the names of Mendelsson, Schumann and Brahms link you in a special manner with the great masters of the past, this concert includes some of their work. We rejoice that it is your pleasure to take an active part which will enhance for both performers and hearers the significance of this commemoration. From For My Grandson. Remembrances of an Ancient Victorian, pp. 123-126. In the latter days of Joachim’s work in England the relations of the quartet with the firm who had for many years been their managers became unsatisfactory, and in 1900 a body of guarantors was formed under the name of the Joachim Quartet Concerts, afterwards the Joachim Concerts Committee, to take over the enterprise. It came into action in 1901, and continued for several years with complete success. The survivors of the first executive committee include my friend Mr. Edward Speyer (who was the specially active founder), Mr. Douglas Freshfield, and myself; Alma Tadema’s name stood at the head. Later Mr. Hugh Godley, now Lord Kilbracken, Lord Monteagle (the present), and Sir Herbert Thompson joined us; later still, after Joachim’s quartet ceased to be heard here, and the name was changed to the Classical Concerts Committee, Mr. Rowe, now the Under-Treasurer of Lincoln’s Inn and still active in the cause of good music. In our case the plan was quite successful. Joachim’s quartet continued to play regularly in London till 1906, within a year of his death, and the Classical Concerts Committee was active till 1912. It was finally wound up some years after the War, and a small balance remaining in its hands was applied — alas! for the purpose being necessary — to the benefit of Joachim’s family. Twice the Committee took the lead in rendering special honours to Joachim. In 1904 he celebrated the diamond jubilee of his first appearance in England in 1844. On the 16th of May a reception followed by a concert was held in Queen’s Hall. 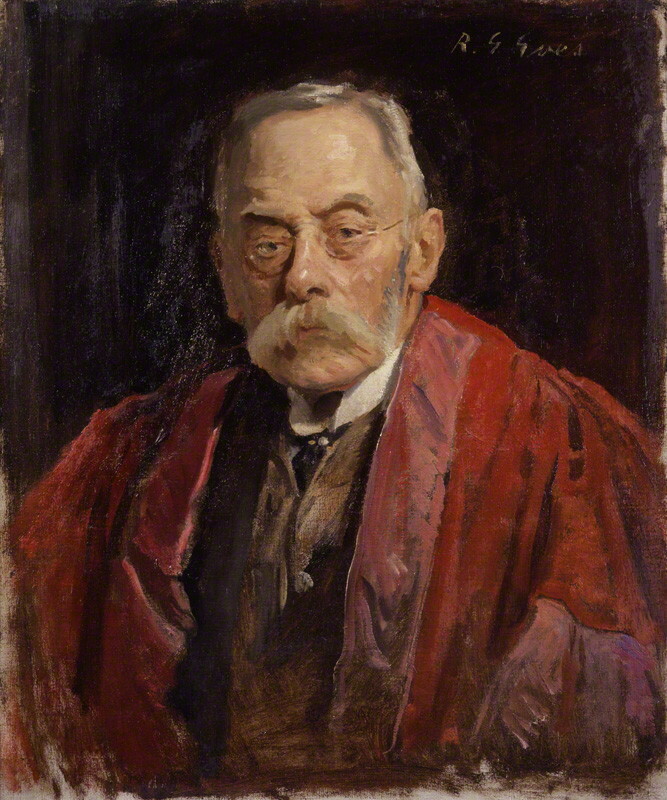 An address written by myself was read by Hubert Parry, and then, together with a portrait of Joachim by Sargent, presented to Joachim by Arthur Balfour. The musician himself took an active part in the concert as both soloist and conductor. My friend Robert Bridges contributed a sonnet which may be seen in his Poetical Works (ed. 1914, p. 377). The address was printed with the program me but not otherwise published, so I reproduce it as an appendix: I took some pains about it and understood that Joachim was pleased with it. Then, in 1908, Joachim having died in August 1907, a memorial concert was given in London under the direction of the Committee (Jan. 23). Dr. Allen, of Oxford, conducted, Lady Hallé was the violinist — the most fitting for the occasion, for she had constantly played with Joachim — and Dr. Tovey contributed a short but very instructive estimate of Joachim as an original musician. It may be that in your time, when his execution is only a recorded memory, his musical genius will be more fully appreciated.